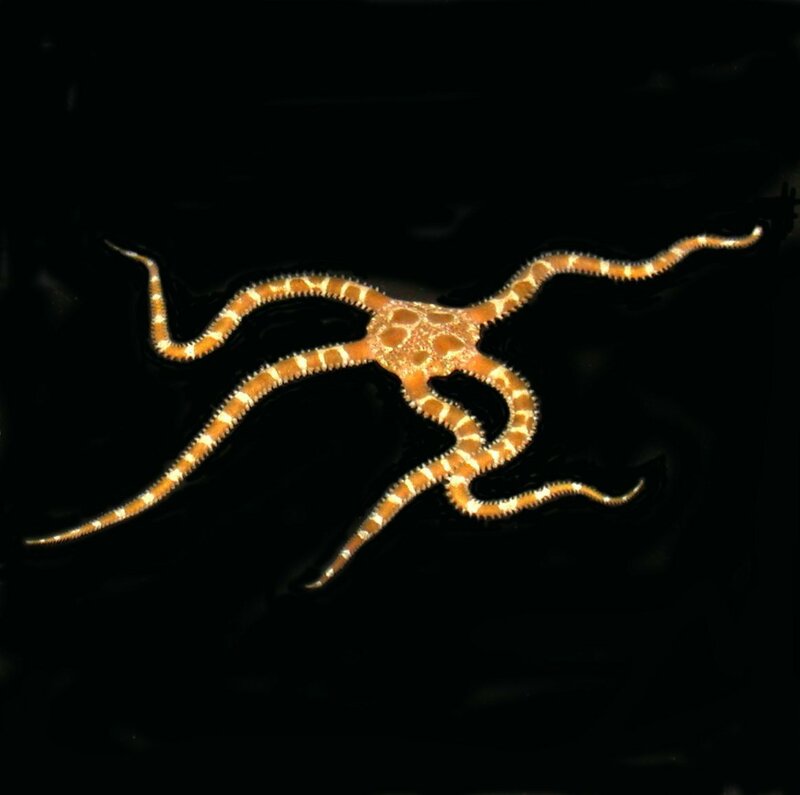 Orange slimy serpent starfish, Ophiomyxra flaccida, sometimes called tiger stars because of their orange and white-banded legs, are an attractive and somewhat uncommon serpent star found in Florida and the Caribbean. These are the smooth skinned serpent stars, often called slimy serpents because their skin surface is slick or slimy feeling. They dont actually release any slime, so dont be put off by the name. The nano size is up to 2 inches in leg length. Like most serpent stars, they like to spend the daylight hours tucked under rocks, but in an aquarium they will quickly come scurrying out when food is placed in the tank. Also like most starfish, they are scavengers so they will not eat your corals or harm most tank mates. They are primarily orange with white bands on their legs. When full grown, the body of these starfish will be about a 0.5 inches in diameter, and the legs will be about 2.5 inches long . Often the larger specimens will lose the banding on their legs. They will do well in any reef tank, nano reef tank, or refugium. These starfish seem to get along well with other serpent and brittle stars and in the wild are often found together under the same rock. This bright orange color phase is very uncommon. There may be other colors available such as green and white, and yellow and white, so if you want something different email us and ask whats available. Ordered a bunch of different gorgonians from these guys, and they arrived in great health. So nice of them to include a freebie as well! Will definitely be ordering more gorgs from them in the future. Thanks again!